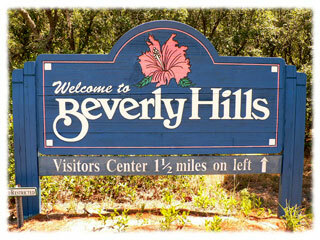 Beverly Hills Florida is located in the middle of Citrus County and offers comfortable and affordable living. The community of Beverly Hills sits atop beautiful rolling hills. Initially development on Beverly Hills was started in the forties and fifties; but recently Beverly Hills has been discovered again. Beverly Hills is right in between the lakes and rivers of the east side of the county, and the rivers and the Gulf of Mexico on the west side. As a part of Florida's “Nature Coast” Beverly Hills isn’t far from opportunities for water sport activities including: boating, freshwater fishing and some thrilling deep sea fishing as well as kayaking, canoeing, water skiing, snorkeling and scuba diving. The in close proximity is the Fort Island Trail Beach in nearby Crystal River; it’s right on the Gulf of Mexico and offers a great view of the spectacular Florida sunsets. There are many freshwater springs, lakes, and seven rivers that run across the county. The local manatee population gives you a once in a lifetime opportunity to swim in waterways surrounding Beverly Hills with these majestic animals. There many dive shops in the area so you can get all the gear you need. There are also boat rentals and manatee tours available. The Beverly Hills Community Center allows neighbors to intermingle with each other, while involving themselves in activities like bingo and ceramics. Central Ridge Library is located within the community, and is part of the state library system. A home in Beverly Hills is perfect for people of all ages: single, retired, and growing families. With plenty of activities, excellent schools and friendly people. If Beverly Hills looks like you kind of community let The Cunningham Team at REMAX Realty One find your dream home. ​Click Below to find Beverly Hills listings in theses price ranges.